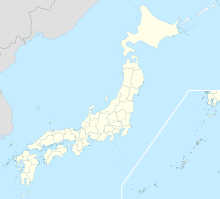 Niigata Airport (新潟空港, Niigata Kūkō) (IATA: KIJ, ICAO: RJSN) is a second class airport located 6.7 km (4.2 mi) northeast of Niigata Station in Niigata, Japan. The first airport on the Sea of Japan coast of Japan was opened on an island in the Shinano River in 1929. This airport was moved to what was then the village of Matsugazakahama in 1930, and was renamed Niigata Airport. It was requisitioned for use by the Imperial Japanese Army Air Force in 1941, and came under the control of the USAAF after the end of World War II. It was returned to Japanese civilian control on March 31, 1958, on which date commercial flight operations were resumed. International services were started in 1973, with scheduled service to Khabarovsk and Niigata Airport became historically an important gateway for traffic to and from Russia, which among other purposes were used to export Niigata-area agricultural products to Russia; however, flights were reduced from winter 2010 as more slots became available for Russia service at Narita International Airport near Tokyo. The airport saw several major service expansions in the spring of 2012, when China Eastern Airlines, Fuji Dream Airlines and All Nippon Airways announced service to Shanghai, Nagoya and Narita respectively. Scheduled "limousine bus" service is provided to and from Niigata Station every 20 minutes and heavily subsidized by Niigata Prefecture. Niigata Airport currently has no direct rail access, although regional authorities have conducted studies aimed at potentially extending the Joetsu Shinkansen high-speed rail line or other nearby ordinary rail lines to the airport. ^ "Niigata Airport" (PDF). Japanese Ministry of Land, Infrastructure, Transport and Tourism. Archived from the original (PDF) on 21 October 2016. Retrieved 7 January 2017. ^ "新潟空港に試練の冬　ロシア極東２路線が運休". Nihon Keizai Shimbun. 30 October 2010. Retrieved 6 August 2013. ^ "新潟空港、増便や新規就航相次ぐ　中国東方航空は上海線週４便". Nihon Keizai Shimbun. 27 March 2012. Retrieved 6 August 2013. ^ "Far Eastern adds Niigata service from Nov 2016". routesonline. Retrieved 12 September 2016. ^ "Peach adds Osaka – Niigata service in March 2018". routesonline. Retrieved 1 November 2017. ^ L, J (21 May 2014). "Yakutia Adds Khabarovsk – Niigata Service July – Sep 2014". Airline Route. Retrieved 21 May 2014. ^ "新潟空港、新幹線乗り入れ検討　アクセス改善委が会合". Nihon Keizai Shimbun. 2 July 2010. Retrieved 6 August 2013. Wikimedia Commons has media related to Niigata Airport. This article about a Japanese airport is a stub. You can help Wikipedia by expanding it.